Playzee is a wacky looking casino. Even the name is a little out there. The name allegedly comes from Zeegmund, a chemist who uses Playzee as is his “lab”. It goes that he uses “a delightful set of play potions” to “concoct games based on today’s most popular online casino UK selections”. Yay, science is cool again! Playzee is a brand managed by White Hat Gaming Limited (Company) and licensed by the UK Gambling Commission, the Maltese Gaming Authorities, and Spelinspektionen. A casino site run as a lab by an eccentric scientist should have a certain charm. Playzee has it in beaker fulls! 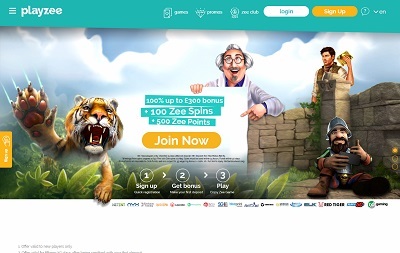 Zeegmund takes centre stage on the home page next to Playzee’s welcome offer of 100% bonus up to £300 + 100 Zee Spins + 500 Zee Points. Scrolling down brings up the games with the best filters I’ve seen on a casino site to date. It’s sorted by top games by default but you can toggle between that and New Games as well as sorting by Popular, Recent, and Alphabetically. You can also filter by game provider, game type, and search for specific games. More casino sites should take note of this! But it’s to be expected from a scientist. The site is super responsive on mobile and desktop. For anyone with super fast internet, Playzee’s site runs great. The problem is if you’re on mobile and don’t have great WiFi or you’re using mobile data. The page might take a while to load on 3G and use up a chunk of your data so be aware. Playzee has all the popular payment methods like Mastercard, Visa, PayPal, Skrill, Neteller, Trustly, EntroPay, Boku and Ecopayz. The minimum deposit and withdrawal amounts are £10. There’s no max deposit and the max withdrawal amount is £2,500/week. Zeegmund the Zany has been very busy in his lab, putting together a collection of over 1,200 games to play. This includes brilliant slot games like Bookie of Odds, Scudamore’s Super Stakes, and Mayan Gods. There’s also a healthy set of table games, live dealer games, and even scratch cards too. Playzee are a kooky bunch. Their brand is like no other casino, with their lab coat-wearing mascot but there’s so much more than that. 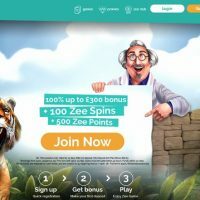 That welcome offer of a 100% bonus up to £300, 100 Zee spins and 500 Zee Points is super generous. The site looks amazing and the games selection is incredible. The filter function stands tall against every other casino. It also has all the best payment methods including PayPal which is a great addition. The fact the minimum deposit and withdrawal amounts are so low also helps for those who aren’t necessarily in it for the big bucks. But if you are, there are a stack of progressive jackpots to play including Mega Moolah Isis. Playzee is for everyone. The only downside is the potential speed and data issue if you’re on mobile without 4G or superfast broadband. There’s no point winning if you’re having to pay out for more internet. Or maybe it’ll pay off if you win one of those jackpots!